Seeing Star Trek: The Next Generation on Blu-ray is something I wasn’t sure was ever going to happen. Sure it seems like the logical next step after CBS completed their work bringing the original Star Trek to HD and Blu-ray a few years ago, but as been detailed on this site before, TNG was not ready for HD. It wasn’t shot in HD and to make matters worse, it was edited on videotape. CBS even tried to do some upresolution tests on the show (which are shown and discussed in an excellent documentary on disc one), but after those were shown to be insufficient they bit the multi-million dollar bullet and decided to rebuild the show using the original film elements, and Trek fans are the better for it. HD shot from "Lonely Among Us"
In a way, the project to bring TNG into HD is not unlike the creation of the show itself back in the 80s. It too faced a number of hurdles to get on the air, including pioneering the market for syndicated drama. And of course creating a sequel TV series had also never really been done and many fans (and those in the media) questioned whether a new show could ever live up to the original Star Trek series, which had itself morphed into a successful feature film franchise at the time. But now in hindsight we know that Star Trek: The Next Generation not only got past its first season, but thrived by creating a whole new (pardon the pun) generation of Star Trek fans, and eventually it too spawned its own feature film franchise, and led the way to launching three more TV series. 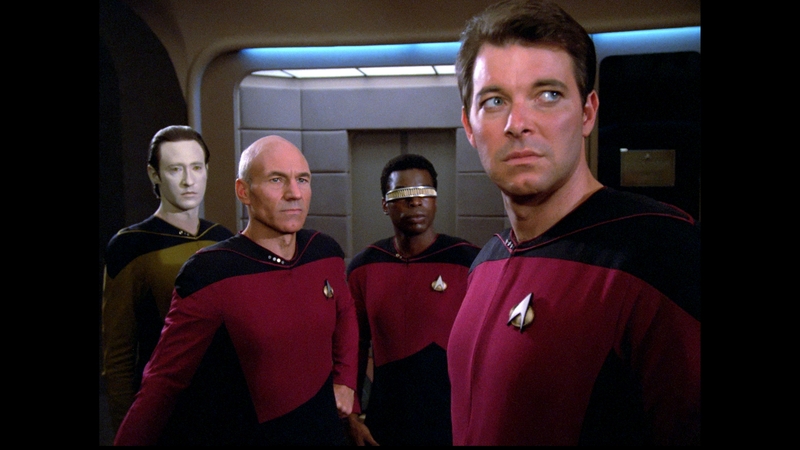 And that whole new era of Star Trek began in 1987 with this now remastered first season of TNG. However, in recent years watching TNG on TV syndication or on DVDs has been a bit of a let down, at least for me. The show just didn’t look that good on a modern HD TV. The same was true (if not even worse) when the series was released for streaming online and at Netflix. But watching Star Trek: The Next Generation in on Blu-ray brings me right back to the excitement of Trek’s return to TV in 1987. It feels like a brand new show, with the exception of it being in 4:3 aspect ratio (more on that below). Before and after shots from "Where No One Has Gone Before"
Watching the Blu-ray, you will notice details you never saw before, but the new HD transfer goes beyond just adding additional definition to the show. The colors are much more vibrant and and feel more real. Of course fans will be especially impressed with the visual effects shots which now appear to be theatrical film quality. Unlike with the HD version of the original Star Trek series, the CBS team has gone out of their way to match the original effects as exactly as possibly. Shots like the USS Enterprise pulling into a Starbase in "11001001" will of course blow your mind, but I was also especially impressed with the improvement in quality you see with mundane establishing shots of the ship orbiting various (previously out of focus) planets. Check out these before and after shots of planets from "Encounter at Farpoint," "The Arsenal of Freedom," and "Justice"
Beyond the remastered visual effects based on original film elements, the new Blu-ray set also features a few brand new CG visual effects. These are mostly limited to things that were done originally in video like the transporter effect, phasers, and photon torpedoes. Probably the most notable new CG effect was the Crystalline Entity from "Datalore," which actually was originally done in CG but they used a new more detailed model for HD. Although in this case I think they may have tried to match the original too much, and I think they could have used current technology to make the entity appear to be even more detailed and facetted. And then there is the 7.1 DTS sound which has also been rebuilt from the ground up. You can even hear the Enterprise whoosh over you! All this is combined with the beautiful music from season one (some of the best of the series) sounding better than ever. The net result, along with the visuals, is to create a cinematic feel you don’t get even with a typical modern network TV series. Three Datas in "We’ll Always Have Paris"
So the new set looks fantastic and sounds amazing, but what about the actual episodes? Let’s face it, season one is a mixed bag. The skirts are shorter (even on the men), the stories are looser, and the speachifying and pontificating is more strident. Every episode seems at least once take a moment to explain to us how people in the 24th century people are really much better than those of us trapped in the backward 20th century. To be sure there are a number of clunkers from eye-rolling Space Africans in "Code of Honor" to having to constantly resist the urge to punch your nice HD TV every time Wesley saves the day, like in "The Battle" (but at least we get to hear Picard say "Shut up Wesley!" in "Datalore"). And don’t even get me started on how ludicrously bad of a villain the Ferengi were, especially in their introductory episode "The Last Outpost" (and they don’t get much better in "The Battle." Thankfully Deep Space Nine later reimagined the Ferengi into a much more interesting (and now beloved) Star Trek race. And the planet full of hot scantly clad joggers episode ("Justice") is so bad that it is in "Spock’s Brain" territory (which may make it a good thing now, at least for MST3K type mockery). But season one also has its highlights. I’ve always been partial to the sometimes silly "Arsenal of Freedom," guest starring character actor Vincent Schiavelli as the Minsonian weapons salesman. The new visual effects also made one of my faves "Where No One Has Gone Before" even better at epitomizing Star Trek’s exploration of different ideas. And in reviewing the show its fun to see the first instances of many things that will be perennial tropes of 21 seasons of 24th century Trek, like our first holodeck malfunction, in "The Big Goodbye." Of course there are introductions of some key recurring characters such as John deLancie’s Q. , Majel Barrett’s Lwaxana Troi, and Brent Spiner as his own evil brother Lore. And in "Heart of Glory" we get our first taste of Klingon honor, that will be delved into throughout TNG, DS9 and Voyager. Watching the first season of TNG you get sparks of the greatness that show will eventually achieve. It is not unlike looking back at home movies of a baby’s first steps. And even though the show was focused on stand-alone episodes, season one had its share of continuing threads including Q’s fascination with humans, the Starfleet conspiracy, and even setting up the Borg in the season finale "The Neutral Zone." We also got the beginnings of seeing what could have been an interesting character arc from Denise Crosby’s Lt. Yar dealing with her past on a very much less than ideal 24th century upbringing, but alas that was all wiped out by a silly black slime creature in "Skin of Evil." As for the packaging, it is fairly basic with a sturdy Blu-ray wallet holding the six-disc set along with a sleeve. The reverse side of the wallet cover has the disc by disc details. The navigation system is (of course) done in a LCARS style with subtle animations and is very straightforward. Also worth mentioning is the excellent set of extras for the set. Firstly the DVD featurettes have been carried over to the set, but there are also new featurettes. Notably there is the aforementioned "Energized: Taking the Next Generation to the Next Level" documentary about the HD project. The doc goes behind the scenes at CBS and shows you every step of the very complicated process for bringing TNG into HD. By the way, for those who have been wondering why they didn’t do the show in widescreen, there is a section explaining how both the live action and effects shots could not be remastered in widescreen. If you are determined to watch the show in widescreen you can always use your TV’s stretch or zoom feature. I tried watching in zoom and it looked pretty good, except some times the cropping makes the close-ups look way too close up. And any fan interested in the genesis of the show will be riveted by the three part documentary "Stardate Revisited: The Origin of Star Trek: The Next Generation." Even the most knowledgeable fan is sure to learn a lot from the cast and crew of the show. It is refreshing that CBS allowed the doc’s filmmakers to show these Star Trek vets discuss both the highs and lows of that first season. In addition they seem to have found all sorts of interesting behind the scenes bits of film, including makeup and wardrobe tests. Keep your eye out on the last disc for an easter egg featuring Brent Spiner reciting an entire scene from Shakespeare’s "The Merchant of Venice" while they were doing camera tests on his make-up. There is also a gag reel, which is a lot of fun (although it was transferred from tape so it isn’t in HD). The bottom line is that season one of Star Trek: The Next Generation on Blu-ray is highly recommended for any fan of the series. You will find yourself rediscovering TNG and appreciating both the little things and the big ideas put forward by creator Gene Roddenberry all over again. The remastering of the show, the new and improved effects, the music and sound all add up to what feels like a new experience for this classic series. Now that the set price is down to around $60 (which is just a bit over $2/episode) it should now fall into more fans budgets. And if you can’t buy it, find a way to rent it or borrow it from a fan, especially to see the new special feature documentaries. I very much look forward to Season 2 (this set includes a preview trailer) and the rest of the series. The first Blu-ray season for Star Trek: The Next Generation comes out July 24th. The six-disc set includes HD remasters (in 1080p and 7.1 DTS audio) of all 26 episodes, plus brand new special features (see below for full details). The official retail price (according to CBS) is $118.00 in the US (which is actually a little less than the MSRP for Star Trek: TOS Blu-ray Season 1). You can pre-order the set at discounted prices. Walmart is selling it for $78.86 Amazon has lowered their price to $59.99 which appears to match Best Buy . The set is also available for pre-order at Amazon sites around the world. TrekMovie.com will be doing individual reviews for each episode from the remastered TNG starting later this week. Just like we did with the original series, we will review every single episode of TNG-R, wrapping up season one around the time that the season two Blu-ray set is released later this year. And check out TrekMovie’s interview with Mike and Denise Okuda, talking about the S1 set as well as future seasons. Honestly, i dont care about the criticism. Season 1 was really something back in 1987! Had to wait 3 years to watch it my country!! I ve ordered it! It is the best gift for a trekkie!! Sound/looks great, many extras! All i need, is a blu ray device, and the season 1 to steer it…….buy!!!!! It is an amazing set. The detail is amazing and the features are great. Did anyone think Haven sounded a bit tinny in the audio, more so at the start. just the audio, music and sound effects were fine, when the 7.1 audio was playing through the standard TV speakers? And the same with 11001001 did it sound echoy. My friend who has the proper 7.1 set up said it was there when he switched back to his standard speakers but gone when he put his 7.1 system on. Anyone else notice this? MST2K? Is that a spinoff of the Mystery Sciene theater 3000/MST3K? I keed I keed….but seriously, those are some GORGEOUS shots! There have been some sound issues reported. For those of you with surround systems, this may be an issue. The character dialogue in some episodes has been mixed into the front right and front left speaker….in addition to the center. Here is the compiled list from over at TREkBBS. Anthony if i may ask, is there an official word for season 2? The rumors floating around say December! Would that explain why it sounds tinny in Haven and 11001001 for when played through the regualr TV speakers? At start of haven it sounds like they are speaking through intercom then gets a bit louder just before the main titles. Said it before and i’ll say it again, I feel like i’m taking crazy pills! Paramount still doesn’t think that we need STTMP DE on Blu Ray or new transfers for the other movies!!! 4:3 ratio? Not worth the effort watching it on a wide screen TV. Oh well. I went last night. The extras were really interesting. Season 2 looks even better with the newly filmed cast reunion roundtable discussion about the series. I’m not sure, but I don’t think it should affect anyone watching with regular TV speakers as the sound would be mixed down to a two speaker mix in that case. At first folks thought it was only a problem with Encounter at Farpoint and hoped for a disk replacement program. Now that the issue across several disks, I’m not sure what CBS will do…if anything. It seems Farpoint is worse though as the dialogue is not evenly distributed between the 3 speakers…it’s off to one side. Would be very distracting for anyone with a 5.1, 7.1 system. Hopefully a fair solution will be reached. For the doco looking at the move to HD, does it talk about the creation of the lossless 7.1 soundtrack? I have to agree about the sound issue. I got the boxset yesterday, and after getting over the initial excitement I sat down to watch “Encounter at Farpoint” and noticed straight away on the opening titles that the sound was a little off right up until Picard’s opening monologue begins, but I have so far only watched the first half of Encounter at Farpoint so can’t comment on other episodes. However, sound issues aside the one thing that struck me is the beauty of the new transfers… The Enterprise – D, never my fave ship I will admit, looks beautiful and shows that for all the great sequences CGI has given us, a real model filmed by experts in their fields cannot be beaten. The exterior shots of the Enterprise in the first episode alone are amazing, I found myself pausing and just looking at individual frames. As cliché as I’m sure it’s going to sound, it was almost like seeing it for the first time. The detail and clarity that was always there but never seen is astounding. The rest of the episode is pretty sweet too. I’ve watched all Star Trek from beginning to end many times, thank you DVD boxset marathons, and wasn’t convinced when reading about “seeing things and noticing details” that just weren’t clear enough before…. but I have to eat my words on that one… for starters, in “Encounter – Part 1” when Q first appears and changes his outfit to the 1940’s era soldiers uniform I noticed for the first time that he is actually holding a cigarette in his hand, a small detail that completes the look but that I have never noticed before. When I first heard about this project, I will admit, my first thought was “Great, another way to get some money out of us!” but after having seen it for myself in my own home…. it was £55 very well spent. My set was already dispatched from Amazon UK and now I have to wait til it gets to Brazil. By the way, I’d like to send a message to any CBS folks out there… please, include Brazilian Portuguese subtitles (if not audio track) in future releases! A few extra subs won’t hurt disc space-wise, and would make a hell of a difference for us down here! Hope they get to address the audio problem as well. just checked on amazon.com and it is £45.56 inc shipping to the UK. Stupid huh. Don’t know it it will get custom charges though. I did tick gift though. Well, to me a planet over 40.000 kilometers away (maximum transporter range) with a starship in front of it should be out of focus. A lot of love was put into this set. Makes me wish I were more of a TNG fan, but sadly, I’m just not as into it these days. The DVDs I have of it (couple seasons) are enough for me, really. Don’t really understand the complaints about 4:3. As an avid Hitchcock movie fan, I enjoy watching many of his films before VistaVision even though they were 4:3. I even forget the bars on the sides after a while. I’d rather see a film or show in its original presentation then some fake me out widescreen. I certainly would not let it deter me from buying a movie or show I love. One thing that helps for my particular TV is my TV is black. So basically the black bars on the side are sort of hidden into the TV anyway, esp. when it’s dark. Well having had a look through the discs, only Haven and 11001001 has the off sounding dialogue. And it is only the dialogue as the music and sound effects sound normal. In the first few mins of haven sounds like it is coming through the intercom and then for the rest the dialogue is just echoy. There is an echo tinny tone to dialogue also in 11001001 .
however, when played in the original audio they sound great. But a friend who has the 7.1 set up saif that is goes away when you have it through the proper set up but did say that it was echoy and tinny through the stereo standard of a TV. Was just curious to know if anyone else noticed this. -Gene Roddenberry went crazy (if Rick Berman is to be believed). -The writers had no idea how to write a 15 y/o wunderkind properly (if Whil Wheaton is to be believed). -Jonathan Frakes had no beard (if TVtropes is to be believed). My wish for the later seasons would be to get rid of Dennis McCarthy’s score and music cues which was absolutely boring and mundane. I wonder if they could make the Enterprise D actually appear to be 3 time the size of the original Enterprise. It’s pretty hilarious the stigma is Next Generation was successful thanks to Gene’s vision… Yikes. Sounds like he was almost the reason it crashed and burned with some of the zany ideas he had going into this..
Paramount would have been taking less of a risk if they’d got Harve Bennett, who knew how to run a TV show, to slide over into executive producing a new Trek series back then, along with co-producing a film every 2 years… Imagine that for a parallel universe eh? Wish this was available on iTunes. To think I bought Season 1 on DVD back in the day for $160. I went to the theater showing last night of “Datalore” and “Where No One Has Gone Before”, which also included some of the documentary footage from the Season 1 Blu-Ray set. I had a great time and the theater (in Maryland) was full. The Crystaline Entity looked very nice. Some of the early make-up tests in the documentary had us all laughing. I’m not a fan of TNG, in fact I think most of it is over-rated, paint-by-numbers, 80’s tv…not what I wanted in my Star Trek… but I’ll admit they did a fine job with this restoration. I worked at a TV station in the 80’s and these look better than the direct satellite feeds we recieved back in the day! Sadly, the stories and acting will always be the same…sigh. Suffice it to say I won’t be watching them again, but my hat is off to those who undertook such a daunting task, a technical marvel to be sure. I watched “The Battle”, which was spectacular. The Stargazer was amazing, and everything felt more alive. The colors were vibrant, and even in Conspiracy, the head exploding was much better. But in the Fall of ’87, it was new, it was exciting, and it was all we had, save for the occasional TOS movie production. The people who complain about the 4:3 are either entitled jackasses or like 20 years old. It was filmed for 4:3 there is no way to crop it without it looking terrible. These are probably the same people who stretch their 4:3 content (Rather than zoom) because it is supposed to “fit the screen” . I’ve always kind of loved the idiosyncrasies of Season 1 TNG. I mean TNG was “the show” back in the day. It was the one that got me into Trek, sneaking downstairs to watch it from the hallway because new episodes were on “past my bedtime”. And compared to the old VHS episodes of TOS Dad was borrowing from the library, it seemed far shinier and more interesting to me as a 6 or 7 year old. Nowadays I like DS9 better, and from an artistic standpoint, as an artist, I like TOS most of all. It was just so stylish – and that’s what I like about this HD update. Look how much style is added by the crisper imagery, brighter colors and better looking planet orbit shots. Continuing on that thought, while Season 1 is inarguably the worst of Next Gen, somehow now post-all-Trek, I really like how beholden it is to The Original Series. As a fan you really get to watch Star Trek transition from one form (Hammy exposition and preaching, godlike entities toying with humans and space races who are blatantly just allegorical) into something new. Part of that was the cast bonding in a way that was unique to them (Same reason the old Shatner/Nimoy/Kelly trio worked so well) and part of it was the concerted effort to be a little more nuanced in the allegory. Can’t wait to really geek out over all the ships and planets and energies. if you have the standard speakers only on TV watching them in original audio is fine. But my friend has said it defintely sounds better if you have full 7.1 set up rather than 7.1 playing through your standard speakers of your TV. Also as I previously said it seems to just be dialogue. Oh and my original point which I forgot while I was diatribing; I think I might actually like Spiner’s makeup test look better than the final Data we all know and love. The greener eyes and silvery hair feel more “Android”, and remind me of other great androids from Ridley Scott movies. Thanks for the review Anthony. One more thing. Where is our Star Trek II 30th Anniversary coverage? I have surround sound, and can hear the problems on 11001101 or what ever it’s called even without them on. I hope tehy give us something to fix this. Can we please get past the Wesley Crusher hate fest? Please? Looks great, but I’m currently in the middle of Season 4 as I re-watch the series during the 25th anniversary. So I won’t be buying any of these sets until well after the whole series is out and I’m convinced I need to rewatch them all again. I don’t understant how people don’t understand that it can’t be made into widescreen. I think that pic above sums it up, if you want widescreen you’ll see stage lights and other things that were not meant to be seen. Duh. Anyway, this transfer looks great! Here’s hoping for DS9!!!! I was hoping we’d get these on TV at some point. Not a fan of the first season, but will go forward and purchase the second, etc. It occured to me after reading about the music in this season that the lousy ‘supermarket’ background music in the subsquent seasons could be replaced in this new reworking of the series. That was one of the minuses of the series, overall. Of course, there were exceptions. Too bad the music is so mundane. Last night at the Times Square screening, some PR person started giving a speech before the show, and got some lukewarm claps when he mentioned Wil Wheaton. Then, someone shouted out that his “personal friend” should get some more love, and there would be no Wesley hating allowed. That someone was LeVar Burton. And he was right. Wesley may have been poorly written for the first season, but he did get better, and he was inspirational to me, as I was only a few years younger than the charicter when the show was on. In fact, after that, Wil Wheaton and Wesley Crusher got a lot of applause throughout the evening. I forgot what the date was yesterday and when I asked my son, he said the 23rd and we suddenly remembered that TNG was being shown at the movies. With an hour to go, we made it with no time to spare and it was well worth it! The extras, the visuals, the sound, etc. Stunning. With the price coming down to the mid $50 range, I’m in to upgrade my complete DVD collection of TNG. Bastards!! !